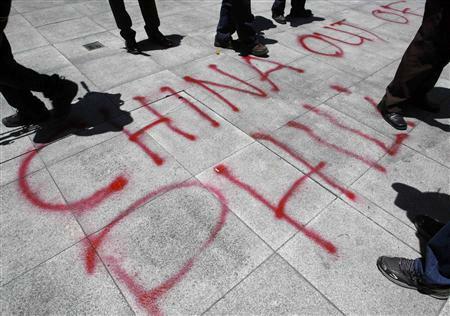 Graffiti done by activists is seen in front of the Chinese consulate demanding the withdrawal of Chinese ships from the disputed Scarborough Shoal in the South China Sea during a protest in Manila’s Makati financial district in this April 19, 2012 file photo. For decades, fishermen along the northwestern Philippine coast treated the teeming fishing grounds of the Scarborough Shoal as their backyard, less than a day’s boat ride away. Now, they see it as a foreign country. “I lost my livelihood when we lost the Scarborough Shoal to the Chinese,” said Mario Forones, a 53-year-old who owns three fishing boats that worked the reef for about a dozen years before armed Chinese vessels arrived in force last April. Reuters interviews with fishermen in two coastal Philippine towns – some of whom tried to fish the shoal as recently as this month – show how the Philippines has effectively ceded sovereignty of the reef about 124 nautical miles off its coast after a naval stand-off last year. China’s consolidation and expansion of its grip on the disputed South China Sea looms over a gathering of Southeast Asian leaders in the tiny kingdom of Brunei this week as they try to kickstart stalled efforts to ease one of Asia’s biggest security flashpoints. Beijing claims almost the entire sea as its territory based on historical records, setting it directly against U.S. allies Vietnam and the Philippines, while Brunei, Taiwan and Malaysia also lay claim to parts. Except for China and Taiwan, all the claimants are members of ASEAN, the Association of Southeast Asian Nations. Diplomats hope leaders at the two-day ASEAN summit starting on Wednesday can put aside bitter differences that emerged last year and pave the way for China to join a proposed dispute-management mechanism. But the fishermen’s accounts vividly show how China’s expanding, assertive naval reach could be overtaking diplomatic efforts to ease a crisis whose stakes have risen with the U.S. military’s “pivot” to refocus its forces on Asia. In rare first-hand descriptions of the situation at the remote outcrop claimed by both China and the Philippines, the men described being chased off aggressively by large, fast-moving, white Chinese ships armed with guns and rockets. In recent months, they said the Chinese vessels had laid down thick undersea ropes to keep fishing boats out. The 10-member ASEAN aims to agree a legally binding Code of Conduct to manage maritime conduct in disputed areas, but prospects for quick progress appear dim. Indonesian Foreign Minister Marty Natalegawa told Reuters in an interview that the summit would mostly be about “making sure that things do not regress”. Even if they agree, China has said it will only join talks when the time is “ripe” and that countries should first build trust by observing a weaker Declaration of Conduct (DOC) signed in 2002, which has so far failed to dampen tensions. Natalegawa accused China of “flouting” the commitment in that agreement to exercise “maximum restraint”. “You are seeing a number of unilateral steps that China has taken that is clearly not in line with the spirit of the DOC,” he said in Jakarta. China says diplomatic efforts were set back by U.S. ally the Philippines’ request in January for a United Nations tribunal to order a halt to Beijing’s activities, such as those at Scarborough Shoal, that it said violated its sovereignty. As monsoon weather eases and China imposes a unilateral annual fishing ban that has stoked tensions with Vietnam and the Philippines, tensions are likely to grow in coming months. China, which has said it will hold 40 naval exercises in the South China Sea this year, further antagonized Vietnam this month by saying it would allow Chinese tourists to visit the disputed Paracel islands for “sightseeing” trips. Two weeks earlier Hanoi accused Chinese ships of opening fire on a Vietnamese fishing boat, a charge that Beijing denied. China stirred alarm in the region last month by sending four warships to land troops on its southernmost claim — the James Shoal, just 80 km (50 miles) off the Malaysian coast and close to Brunei. The crew of the ships held a ceremony on the shoal, swearing an oath to defend and “build up” the South China Sea and protect China’s sovereignty, state media reported. The show of strength likely ruffled Malaysia, which has taken a more low-key approach than Vietnam and the Philippines over its claims. Regional navies are no match for China, but the United States, which has said it has a national interest in maritime freedom of passage, is beefing up its forces in the region, especially after recent tensions with North Korea. U.S. B-52 and B-2 bombers flew sorties over South Korea in recent weeks and Washington is moving the Terminal High Altitude Area Defense (THAAD) ballistic missile defense system to its Pacific base in Guam. Last week, the United States sent the first of its Littoral Combat Ships, a new class of a coastal warship, on an eight-month deployment to Singapore. Tensions over the dispute first peaked last year in the two-month stand-off between China and the Philippines at the Scarborough Shoal. Forones, the fisherman in the coastal town of Masinloc, says he was working at the shoal when the confrontation started. Since then, his catch has shrank so much that his wife has switched from selling fish at the local market to selling pork. He said he was considering selling one of his three boats and his delivery truck. The Scarborough shoal is famed among fisherman for its rich waters, packed with turtles and squid as well as fish such as grouper and mackerel. The long monsoon season means it is only accessible by small boats from January to May, giving fish stocks plenty of time to recover each year. Forones and other fishermen still try to fish at the shoal, face a tense cat-and-mouse game with the Chinese ships. “It’s really scary now,” said Miguel Betana, a 45-year-old boat captain, who has fished at the shoal for 15 years. When he was last there in late March, he saw five Chinese ships, four of them sitting at the shoal’s mouth. After being chased off by one armed ship, he said he returned under cover of darkness to resume fishing. Zaldy Godores, a 34-year-old from the town of Santa Cruz, said his boats could no longer fish far from shore because they had lost the protection from storms provided by the shoal. Forones said three of his ships were chased as far as 24 km (15 miles) from the shoal in January. That was when he noticed that the Chinese had submerged an arm-thick rope stretching across the shoal’s mouth to snag boat propellers. “We are like thieves, stealing what really should be our riches,” Forones said. A large military hospital newly built on Hainan Island indicates that China’s hard-line attitude in South China Sea is not merely bluffing. The Hainan branch hospital is located at Haitang Bay, SanyaCity with a land area of 60 hectares. It bagab construction in August 2009 and was completed and put into trial operation at the end of last year and formal operation on June 9. Li Shuzhang told “PLA Daily” that construction of the branch hospital was a policy decision of the CPC Central Committee and Central Military Commission. The Commission requires that the hospital shall be built into a first-class first aid and treatment base for battle and first-class health and recuperation base for cadres. Li Shuzhang said that building the medical city aimed at improving and ensuring the medical service standards for the garrison, enhancing the combat capability of the troops stationed on islands and ensuring officers’ and soldiers’ physical and mental health. The hospital is making efforts to improve its capability to provide ensured services for military struggles. It will establish as soon as possible emergency health logistic safeguarding for both piece and war time so as to “improve overall aids and treatment for major military actions and marine actions and set up a three dimensional sea, land and air emergency aids and treatment system”. Li said that stationed at a forward position of the South China Sea, the Hainan branch mainly serves the troops on the first line, especially provides health, disease prevention, first aids and treatment for the troops guarding the islands and reefs and basic-level officers and soldiers on special duties. In the future, it will continue to strengthen all-round coordination with its parent hospital in Beijing and conduct long-distance consultations of doctors, etc. to extend the range of the branch’s service of first aids and treatment in order to “do a good job in providing medical safeguarding services for the officers and soldiers on Nansha and Xisha Islands”. PLA General Hospital was formerly called “PLA 301st Hospital”, an army-level unit under PLA General Logistics Department responsible for providing medical and health services for party, government and military leaders. Being the first branch it has ever established in another place, its Hainan branch has therefore got the nickname of “Hainan 301”. The branch is a division-level unit staffed with over 1,000 medical workers all selected from the Beijing headquarters. SCMP’s Teddy Ng reports from Beijing, that as PLA major reshuffles in Hainan are announced, regional commander tells forces there to be ready for developments in disputed waters of South China Sea. “Military analysts believed the new appointments to be an indication that the military was preparing to take a tougher stance. via SCMP.com – Reshuffle linked to islands dispute. SCMP’s Teddy Ng reports from Beijing, “With a key Asean meeting looming, state media have stepped up their coverage of China’s commitment to protect its claim to the disputed SpratlyIslands in the South China Sea. They report increased patrols by surveillance vessels that are ‘collecting evidence’ of infringement by other claimants to the islands. via SCMP.com – Beijing steps up patrols ahead of Asean meeting.